Maybe it's the former teacher in me, but August 1st always feels like the beginning of the end of summer. While we have quite a bit planned for the rest of this month, family visiting and our first official family vacation since the kids were born, we are also getting geared up for the fall and the start of school. This year will be Tim's last year of undergraduate work. This will also be our first "real" year of "homeschooling" Emahry. I think Tim and I have narrowed in on our preferred method of training Emahry into short structured sections of learning (say that 5 times fast) and will be implementing a lot of our own ideas as well as activities from Laura's Learn your Letters...Learn to Serve and the Songs for Saplings ABCs CD. We will also spend time each week compiling a few activities into a letter lapbook that we can use to review and reinforce Emahry's learning (and hopefully use with Jonathan in a couple of years). We look forward to sharing our homeschooling adventures with you and would love to know how you are preparing for the coming school year. Looking for Some Great Giveaways? If you have a bit of down time and are in search of some great giveaways go check out Giveaway Scout. You can browse all their listed giveaways here or browse by category. You can also list your blog with them to help spread the word about your own giveaways. I recently discovered that our blog does indeed leave a carbon footprint. Why had I never thought of this before? I have no idea. However, we've now taken the first step to make our blog carbon neutral. From the website: “My blog is carbon neutral” is an initiative, originally started in Germany by the “Make it Green” programme, that has the goal to reduce carbon dioxide emissions. We plant a tree for your blog and thereby neutralise your blog’s carbon footprint for the next 50 years! Everyone can make a small contribution to the environment. Every tree counts! 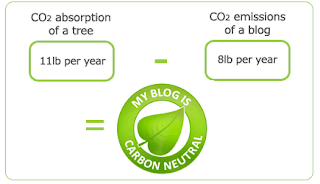 Would you like to make your blog carbon neutral as well? Just head over here to begin. I was very excited when Laura from Heavenly Homemakers announced her new Preschool curriculum, Learn Your Letters... Learn To Serve a couple of weeks ago. 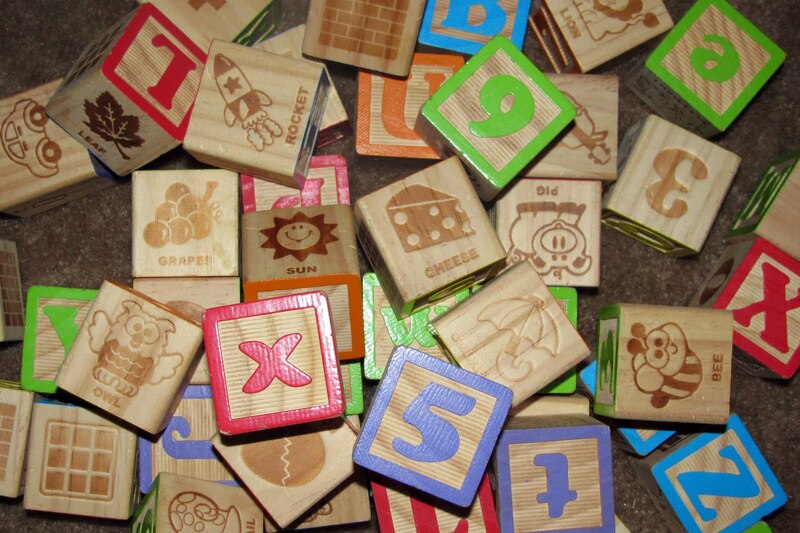 I've been busily preparing my own preschool curriculum to use with our 3 year old Emahry. However, with three children age three and under I definitely have my hands full and was finding it difficult to spend time organizing all of my ideas. When Laura introduced her curriculum it sounded like it would fit perfectly with what we were already doing. I was thrilled when she agreed to let me review it and then tell you all about it. Laura's 240+ page kit includes lesson plans, games, crafts, recipes, memory verses, Bible story suggestions, vocabulary activities, play, books to read and so much more…all while encouraging service to God! The format for each letter is the same which allows the reader to quickly find the information they are looking for. I also like that the song suggestion for each letter is written to the same easy tune so that I don't need to teach an additional tune each week. I also like that the recipes that are provided in each letter's toolbox are simple and made with easy to find ingredients. I love that each letter includes suggestions for service. This idea fits perfectly with praying for people whose names begin with the letter you are learning. We put this idea into practice last week when we delivered homemade applesauce to our neighbor Mrs. Amy. For us, it's so important that our children grow up with hearts that want to serve others. Learn Your Letters... Learn To Serve offers suggestions for each letter that will encourage your child to make gifts or food, offer help and learn to think of others. I also love the activity ideas as well as the detailed recipes, instructions, and photos that are provided in each letter's "toolbox." Having all of these activities in one location is so much easier and quicker than spending time searching for ideas in books or online. We will definitely be using this kit to supplement what we are currently doing to teach Emahry and Jonathan but Laura's kit can also be used all on its own as a complete early learners curriculum tool. Even if you have no intention of homeschooling this resource would be perfect for any family who would enjoy giving their small children a firm foundation in academics as well as service. 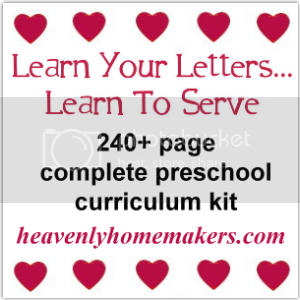 Learn Your Letters, Learn to Serve Curriculum Kit may also be purchased for use in a Sunday School or Preschool Classroom. It would also be a great way to teach service to little ones who may be in your home based day-care. If you'd like to see more of what this kit offers, feel free to check out this free sample lesson! I know this Preschool curriculum will be a blessing to our family as we learn and serve together! You can purchase your own copy of this incredible complete Preschool curriculum for only $45. Click here to view more details. Also be sure to check out all of Heavenly Homemakers' recipe and homemaking E-books, Kids' Character Charts, and downloadable Recipe Card Packs. Click here to visit Laura Coppinger @ Heavenly Homemakers. Disclosure: Link provided are affiliate links. If you purchase through clicking on these links your purchase won't cost any more but you will bless our family financially with a percentage of your order total. Thanks in advance! 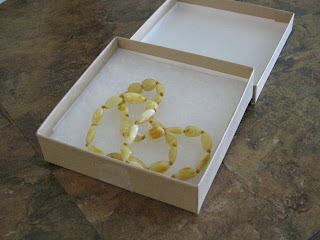 Inspired by Finn sells Baltic amber and hazelwood jewelry. We discovered them a few months ago when we were in search of a nature teething remedy for Jonathan (then 19 months old). 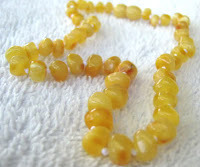 We entered several teething necklace giveaways to no avail so we were thrilled when Inspired by Finn agreed to let us review one of their Baltic amber teething necklaces. 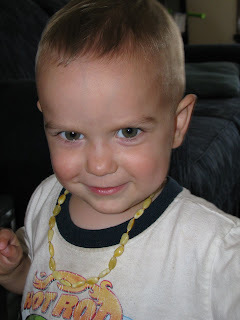 The first time I heard "teething necklace" I thought people were crazy. Why would anyone give their baby or toddler beaded jewelry to chew on! However, once I looked into it a little further I realized that no, people weren't allowing their children to chew on the jewelry. Instead the Baltic amber is worn on the skin so the skin’s warmth can releases trace amounts of healing oils from the amber. These oils contain succinic acid and are absorbed into the skin. This Succinic acid is a mild pain reliever and when worn near the area of discomfort can have pain relieving affects. We decided that we wanted the highest level of succinic acid, so we chose a necklace that is light colored and opaque. Jonathan's new necklace arrived in a cute gift box. 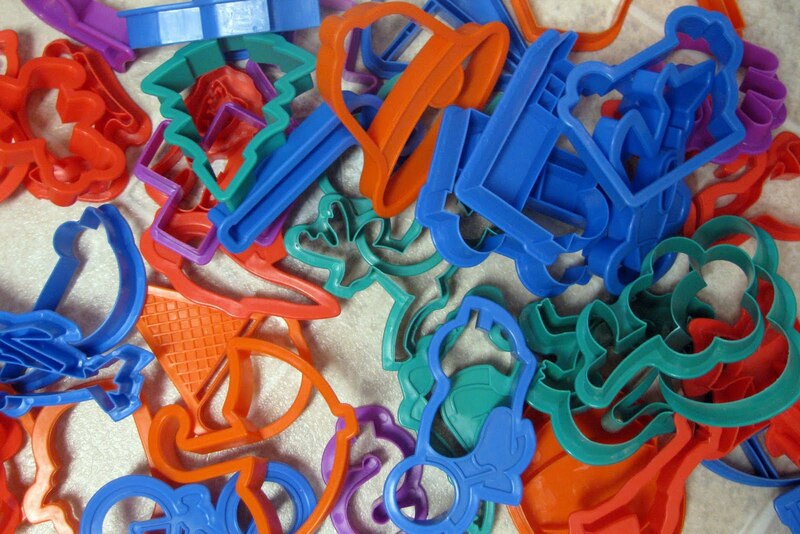 All of Inspired by Finn's jewelry is lead-free and phthalates-free and it meets all US legislative testing (CPSIA) requirements for children's jewelry. The necklace has an easy to use, secure closure. Each bead is individually knotted and the necklace will break if pulled (we didn't try this), which is good for safety's sake. Even so, we personally, did not put the necklace on Jonathan's neck for bedtime. Instead we wrapped it twice around his ankle and placed a sock on that foot to keep the beads warm and touching his skin, and to keep him from taking it off. After I took this photos, I tucked the necklace under his shirt, so it was in contact with his skin. The necklace is absolutely beautiful, and I definitely want one for myself only because it is so pretty! I can't say that it definitely eased his teething pain, because it's his pain not mine and he is not yet very verbal. However, when he started wearing the necklace he did begin falling asleep easier and woke up less frequently throughout the night. Jonathan's teething pain seems to be mostly over now as we're just waiting on one more stubborn little tooth. But, we'll definitely be holding onto this necklace for Eliya who is just beginning the teething process. Here's a few more of our favorites from Inspired by Finn. Just click the image to view the listing or browse the entire store. 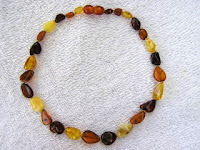 Head over to Inspired by Finn to order your own Baltic Amber or hazelwood jewlery. "Like" Inspired By Finn on Facebook for discounts of up to 25%! Inspired by Finn is offering one of our readers any necklace (round bead, chip, disc, or bean style) up to 17" long that they have in stock (or a bracelet if you prefer). 1. Head over to Inspired by Finn and browse through their site. Then come back here and leave a comment telling us something else you learned about Baltic Amber jewelry or which necklace you'd love to have. The giveaway will end Monday, August 1st at 11:59pm EST. We will pick the winner through random.org. Make sure you leave a way for us to contact you. The Jesus You Can't Ignore: What You Must Learn from the Bold Confrontations of Christ looks at several key sermons Jesus gave during His 3 year ministry on earth. MacArthur examines Jesus' teaching style, audience and the background behind the sermon. The purpose of this book is to point out the major flaw in modern churches of shying away from truth and only embracing Jesus as a messenger of mercy but not justice or holiness. We would rather not offend than tell the Truth of the Gospel. We use one sided attributes of Jesus to justify this approach and in some cases even use false attributes to make Him more appealing. The first chapter of this book was a little difficult to get into, but was much more interesting once MacArthur began addressing specific scenarios. 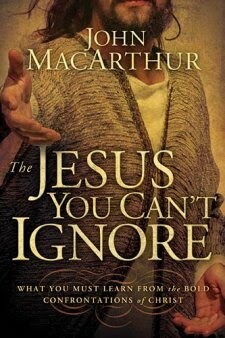 We appreciated MacArthur's stance on showing the boldness of Christ's teachings, especially in a time when so many shy away from acknowledging the whole character of Christ. This book encourages us to stand up for truth just as our Savior did. There is no room for dialog, no room for alternate paths. We can only be saved through faith in Jesus Christ. It's frustrating, although we're not surprised, to read of some of the ways the Gospel is being watered down and picked apart. It really is a shame that a lot of Christians are more worried about upsetting other people as opposed to displeasing God. So far this summer, we've traveled over 35 car hours with our three small children. While we may take a short car trip in August, for the most part we've finished our summer trips. However, if you still have a trip coming up here are a few ways to add some fun to those long hours in the car, or on the plane, etc. 1. Make your children personalized I Spy Books. Simply take photos of collections from around your house. Pile those Matchbox cars and take a picture. Dump the bin of doll accessories and snap another photo. Arrange all of your letter magnets on the fridge and take another shot. Then print your pictures and slide them into the clear sleeves of a dollar store photo album. This works well even for younger children. 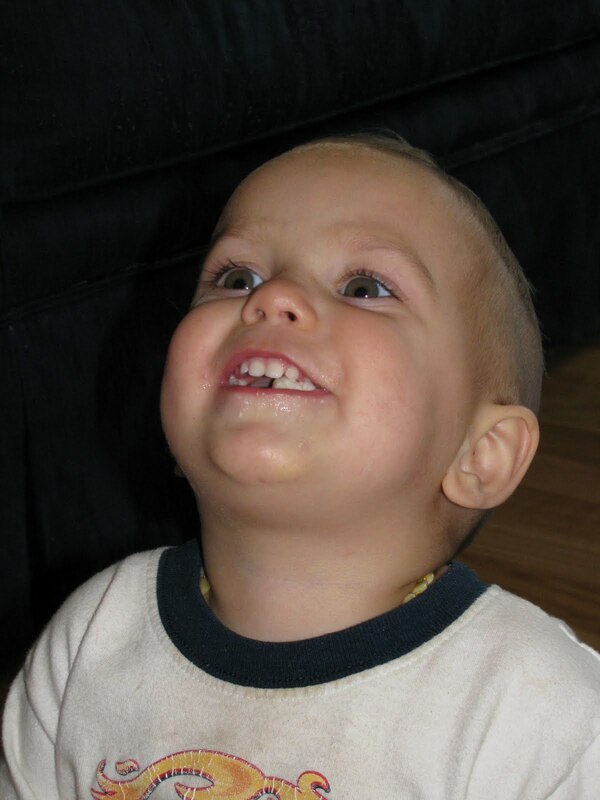 Jonathan (22 months) was able to identify most of the items since he is familiar with seeing them at home. One thing I would change next time is to fold clear packaging tape over the openings of the photo sleeves so Jonathan wouldn't be able to pull the pictures out. With older children this probably wouldn't be a problem (Emahry, age 3, did fine). This works well for car rides and for school-aged children. 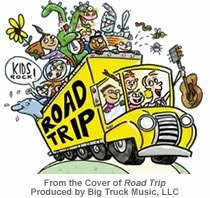 Find images of objects you might see while traveling by car (tractor trailer, road signs, McDonalds' golden arches, a bridge, a blue van , school bus, police car, etc.) Print them from clip art or online image searches, cut them out from magazines, or draw your own. Glue these pictures onto 3 1/2" x 5" index cards and place in a photo album from the dollar store. For older children, make individual checklists and see who can find the most or have everyone work together to find a certain number of objects. Look for new to you items at yard sales or thrift stores throughout the year and store them away as trip boredom busters. Pass out one at a time as boredom sets in. These are a great way to keep all the pieces of a game from being scattered all over your vehicle. 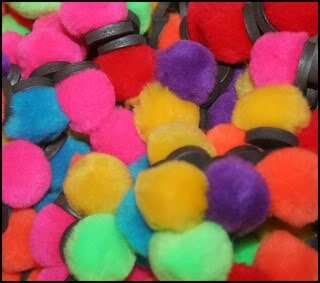 These magnetic pom-poms are a great open-ended activity and can be made very easily. When combined with a metal cookie sheet or pie plate they are sure to provide a lot of fun making letters, shapes, pictures, etc. 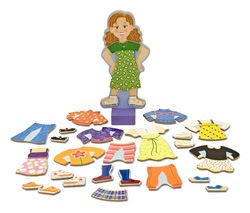 If you're looking to purchase an activity, this doll set would be great fun for a little girl. These magnetic words would be a lot of fun for writing poems or silly stories. Do you have any tips for traveling with small (or not so small) children? We'd love to hear your ideas!